God’ Not Dead “Hold You Up” has hit number one in the charts. The film grossed over $40 million since March 1st and has astounded critics over its popularity. 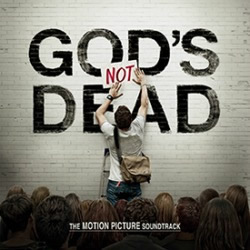 God’s Not Dead-The Motion Picture Soundtrack features tracks from Newsboys, Superchick, Jimmy Needham, Stellar Kart, JJ Weeks Band and Tricia Brock, among others. Additional singles “This is The Time” and “What I Know” are to follow. Purchase the album online here. Inpop Records’ March 4 release God’s Not Dead-The Motion Picture Soundtrack turned out its first hit song this week with “Hold You Up,” currently No. 1 on the Nielsen/BDS Hot AC/CHR chart. The single’s success reflects continued momentum for the album as well, which maintains its position among the Top 10 soundtracks on iTunes’ Top Soundtracks chart. Grossing more than $40 million in box office sales since its March 21 release, Pure Flix’s GOD’S NOT DEAD movie has helped to fuel success of the soundtrack too. Its lead radio single “Hold You Up,” which initially launched last September, soared to No. 1 a mere four weeks following the film’s debut. Consequently, the song; performed by actor/musician Shane Harper (Disney’s “Good Luck Charlie,” “High School Musical 2,” “Flipped”), who also stars in the movie; currently boasts more than 25,000 downloads, nearly half of those in the last month alone. Rachel Leigh with KPUL-FM in Des Moines, Iowa, comments, “I was impressed with Shane’s style and lyrical content in ‘Hold You Up’ from the get-go. Eight months later, it’s still our top-testing song!” Furthermore, the record has consistently ranked among the Top 10 general market soundtracks on iTunes since GOD’S NOT DEAD opened in theatres. It’s truly inspiring to see a song from God’s Not Dead hit number one in the charts. There are plenty of people in the United States still love God and prove the United States is still a predominantly Christian nation despite what some people think and say. We hope this hit is just the first of many as people get more familiar with the soundtrack. If you haven’t seen God’s Not Dead yet, it’s available on most of the cable television networks’ ‘On Demand’ channels. God’s not dead — fantastic title for a new movie that actually supports Christianity. I have not seen it yet but I plan to and will report on it on our Facebook page (http://facebook.com/christianculturecenter). In the meantime, the previews look great. Here’s the official movie trailer for God’s Not Dead. Once you’ve seen it, use the comments below to post your opinions and observations. If this is what it seems to be, it’s an excellent example of doing something to promote Christ in culture.